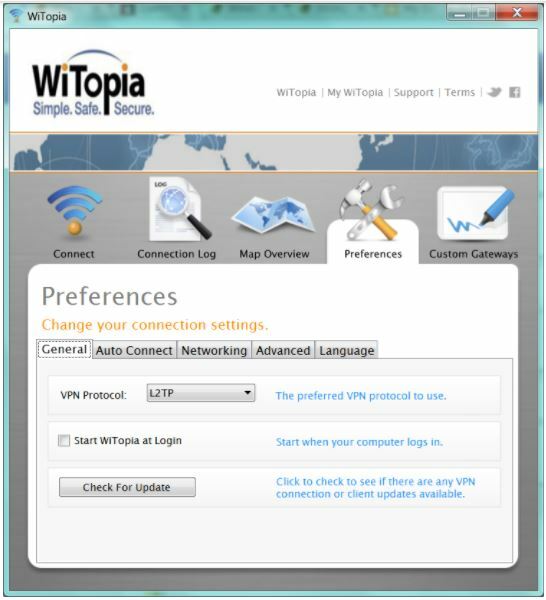 WiTopia is a US-based company offering a Personal VPN solution since 2005. They brand it as simple, safe, and secure, backed by a network of servers in 73 cities across 44 countries and customers in more than 160 countries from all over the world. The provider offers OpenVPN, L2TP/IPSec, PPTP, unlimited switching and bandwidth, support for a wide range of platforms, a free DNS service, and 256-bit encryption. WiTopia doesn’t invest much in user experience since even choosing a subscription plan is like a trip to the past. Their shop is cluttered with VPN plans and hardware offerings, which make it confusing to navigate. There is no free trial on offer, but a 30-day money-back guarantee is supposed to remedy your doubts. Except for it doesn’t. The catch is – and catch with a VPN provider is never a good sign – that there is no short-term subscription for a VPN plan that supports OpenVPN protocol. The only plan you can buy on a month-to-month basis is personalVPN Basic priced at $6/mo, $29/six months, $50/one year, $80/two years, or $110/three years. Basic covers PPTP, IPSec, Cisco IPSec, Mac, and Windows software. Their personalVPN Pro subscription supports OpenVPN protocol but has no monthly tiers. $40 buy you six months of Pro, $70 – one year, $120 – two years, and $160 – three years. The perks of Pro include support for OpenVPN and 4D Stealth™ protocols, 256-bit encryption, unthrottled servers, and the same 30-day money-back guarantee. Another catch is WiTopia doesn’t allow you to sign up until you submit your detailed personal and billing information complete with address and phone number, and they only accept payments through PayPal and credit cards. Not exactly the kind of treatment you’d like to get from a provider selling online privacy. WiTopia doesn’t allow you to access any downloads until you verify your email – even after you’ve completed the payment. 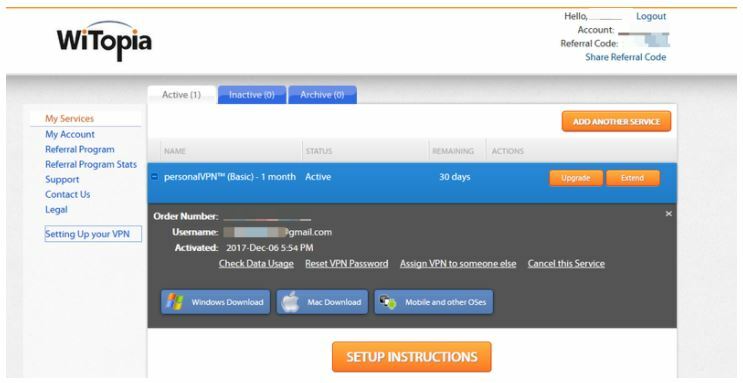 Only after you verify your email can you download the software installer and set up a different login/pass combo for your VPN. I tried their monthly Basic plan to get the feel of the service. Their desktop software looks stuck in the Windows XP era. It’s not intuitive, and instead of scrolling through a servers list, you need to go Advanced Connect to pick a server and the protocol. No love for OpenVPN for Basic users, alas. The app lists a map of servers, a fast connect button that picks a server close to you, and ways to customize a few connection settings. Overall, it’s not the ugliest but certainly not the best VPN client I’ve seen. I would prefer an actionable and sort-able list of servers to the useless map located in two tabs and occupying too much app’s real estate. Their 24/7 live support was available, friendly and helpful, so kudos for that. The customer’s dashboard is minimalist. You can download your VPN client, check data usage, reset your password, and assign VPN to someone else. It also lists the number of remaining days in your subscription. “Setting Up Your VPN” takes you to the knowledge base with sections sorted by OS. You can install it on Mac, Windows, Surface Pro, iOS, Android, Ubuntu, Chromebook, Amazon Fire HDX, Blackberry, Boxee, HP webOS, and even Symbian. The perks of Witopia’s VPN aren’t all that numerous. You can set up your favorite gateway, connect at system boot, automatically connect when your device connects to an unsecured WiFi, set up custom gateways and view your connection log (very detailed). 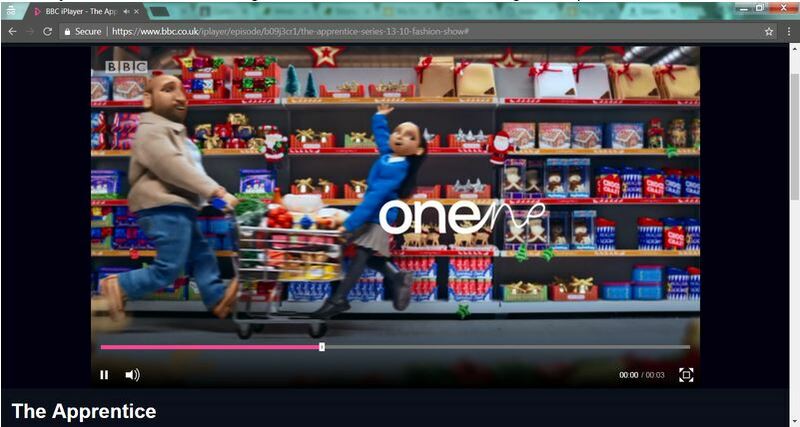 There are a few links to the company’s terms, support, and social media accounts that launch your default browser and open a corresponding web page. That’s too basic for $6/mo if you ask me. There needs to be an OpenVPN-enabled monthly subscription, even if it’s stripped of the other less secure protocols. Notably, the document then goes on to explain what they do with the collected data (send updates, improve the website and so on). It’s a US-based provider, so data retention laws, gag orders and subpoenas in, privacy protection laws out. 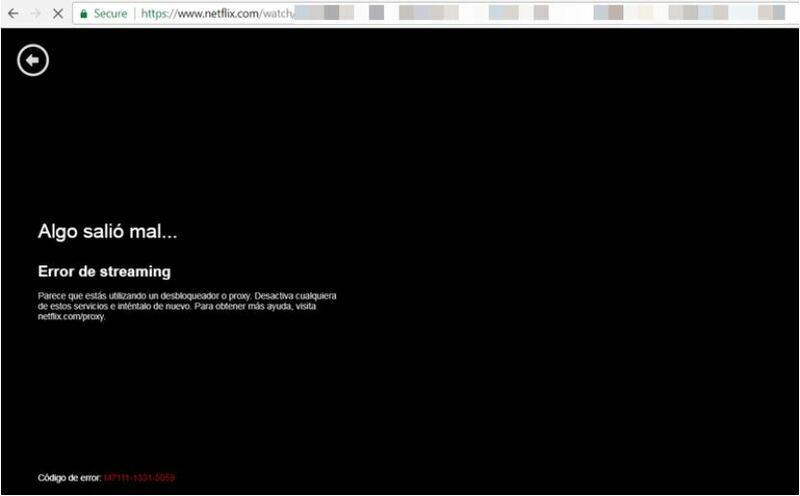 Understandably, you won’t be file-sharing copyrighted content when connected to WiTopia VPN. Their jurisdiction is in Fairfax County, Virginia. With OpenVPN available only in Pro plan with a long-term subscription, the privacy and security of their Basic plan are only good for basic things like streaming. 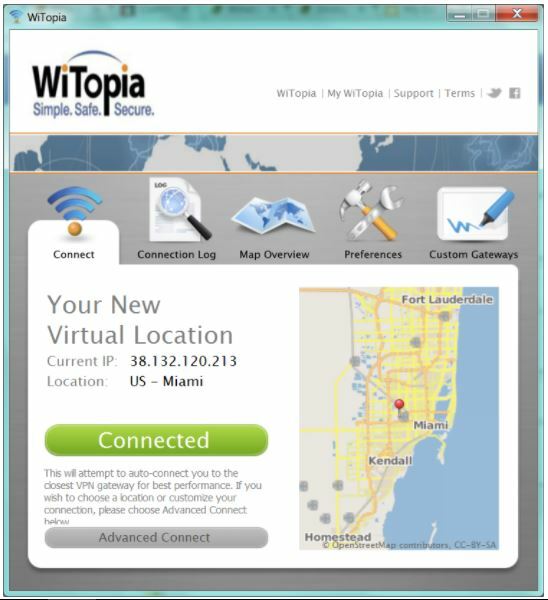 WiTopia VPN might be one of the veterans on the market, but its service, subscriptions and the software UI are desperately outdated. I find it hard to recommend since it’s not the easiest – nor the most useful or feasible – VPN out there. It’s mediocre at best and certainly not the kind of VPN you should be buying if you’re a beginner. There are much more solid options on the market right now, and until WiTopia overhauls its service to make it more competitive and reasonable, I don’t recommend it.